If you're like me when it comes to Halloween, then you'll love the run up to Halloween and all of the pumpkin style things that come out every year but you're not a massive fan of getting all dressed up and prefer to make a small statement instead. I thought today i'd share an almost lazy girls kind of way to make minimal effort on Halloween, whilst still looking like you've made some effort when it comes to your costume. When it comes to Halloween I am one of those girls that will dress up but still look semi normal, for example last year I wore a red ASOS dress, with some devil horns and then applied some fake blood, making it look like i'd made some effort whilst still looking somewhat normal at the same time, and these kind of looks just work for me. 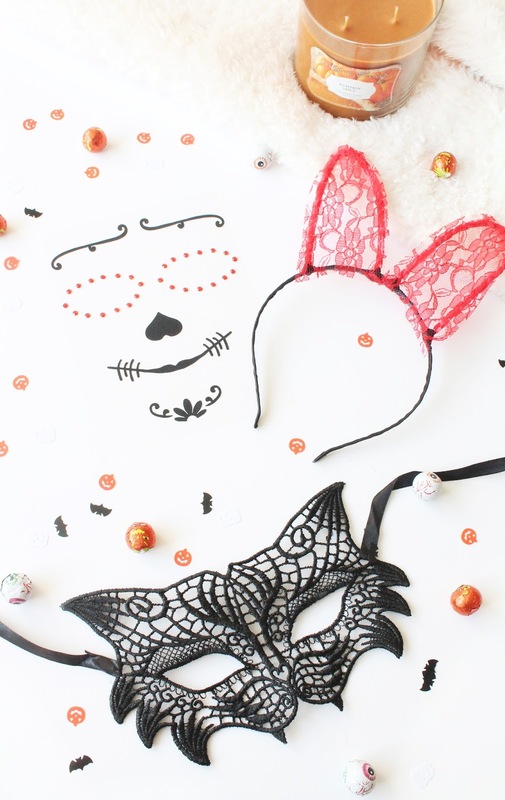 This year i've teamed up with the lovely team at Johnny Loves Rosie to share some minimal effort Halloween costume idea's with you from their latest range of Halloween Accessories. When it comes to Halloween, one of the easiest looks a girl can go for is a cat as they are super simple and you can create some really fun looks I think if you play around with your eye makeup. Another option of course is to go for a mask, which for a gal like myself I am more likely inclined to do so as you can just whip it off at the end of the night, and not have to worry about waking up with whisker imprinted on your pillow! This Cat Eye Mask* (£18) would be the perfect costume option with a smokey eye and a black lace dress of some description. A massive trend at the moment that I am loving is the glitter and gem stone style makeup looks, and I am really intrigued to see what looks come about this coming weekend for Halloween. I'm definitely going to be using this Skeleton Face Tattoo* (£8) along with my makeup look as I love playing around with these kind of looks and it makes it so easy for those who aren't that good at experimenting with makeup. What is also good about these face tattoo's, is that they are so easy to remove at the end of the night, which means no faff is involved! I'll definitely be posting up some Halloween selfies if I do dress up this weekend coming, so be sure to keep an eye out for those! Lastly, a look I always turn to for a last minute Halloween look is a devil as it's so easy to whack on some horns and get yourself a devil stick, especially if you've already got the costume bits from previous years. The only thing I do find is that someone will try to steal one your horns, no matter how tightly it is attached to your hair. This is where this Devil Ears Headband* (£12) would come in handy as it's simple to just pop on and style your hair around with trying to hide any annoying grips. These, with a red eye look and a vampy red lip, and you are good to go! If you're still stuck for Halloween costume ideas then i'd definitely recommend checking out Johnny Loves Rosie, especially as they currently have 50% off all of their Halloween range!